Risk Management Commodities (RMC) is a full service commodity brokerage and agricultural risk management firm founded in 2001. RMC is also a registered member of the National Futures Association, the self-governing body that regulates the commodities industry. With over a decade of experience in farm risk management as well as generations of experience running our own farm operations, RMC brings a personalized approach to your operation. RMC’s client base spans the Corn Belt, with businesses throughout North America. Our highly skilled team delivers individualized strategies, sound advice and solid recommendations based on extensive research and market analysis, giving our clients a competitive edge in today’s complex marketplace. RMC takes pride in maintaining objectivity. We provide an impartial analysis along with the kind of grassroots perspective that most brokerage houses can only dream about. Risk Management Commodities provides a holistic approach to risk management and farm production marketing. It is our mission to provide innovative strategies to secure margins and mitigate risk. We help you identify risk areas, and then manage those risks with the most appropriate strategies for your operation. From locally focused coverage to national exposure, RMC’s growth has been a remarkable success story and our prospects for the future remain strong. 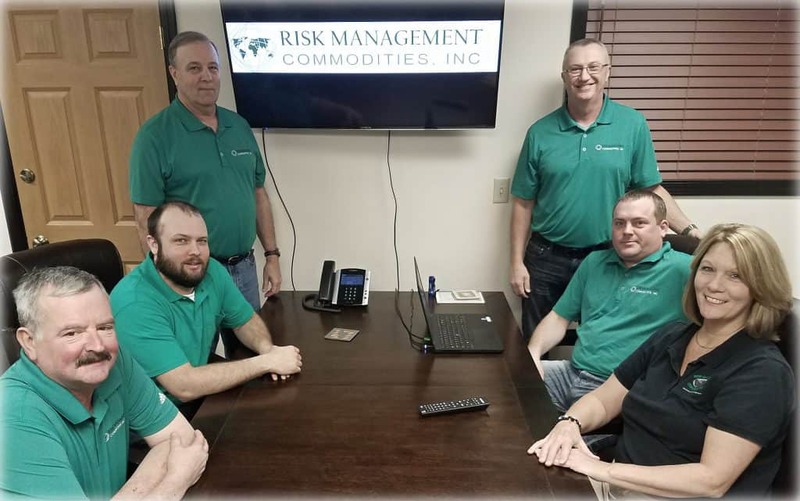 Risk Management Commodities has a consortium of Ag businesses---including Sagamore Ag Source LLC, Input Management for farmers, Ag Producers Insurance Agency Inc., and Horizon Ag Consulting that provides Agronomic & Business Consulting. Together, we believe we have tremendous knowledge about agriculture commodities and marketing, crop insurance, property and casualty insurance, agronomic needs and farm management needs. Risk Management Commodities, Inc. (“RMC”) acts as an Introducing Broker to INTL FCStone Financial Inc. (“FCStone”). Your account is held and maintained at FCStone. FCStone is registered with the Commodity Futures Trading Commission (“CFTC”) as a Futures Commission Merchant (“FCM”) and is a member of the National Futures Association (“NFA”) (NFA ID: 0476094). RMC is registered with the CFTC as an Introducing Broker and is a member of the NFA (NFA ID: 0314016). Chuck is a 5th generation farmer living on his family farm near Lafayette, IN. He operates a grain and cow/calf operation with his son, Bryan. He graduated from Purdue University with a BS degree in Agriculture Economics. Chuck became a commodity broker in 1991. His understanding of production agriculture as well as marketing gives him a perspective of markets that allows him to look at both sides; producing and selling his crops or livestock. Chuck is a founding member of Risk Management Commodities and enjoys helping farmers improve their marketing. Bill was born on a dairy farm in Indiana before his dad decided to go to college. After his dad finishing his studies, they found their family in the Chicago area as his dad took a position on the floor of the Chicago Board of Trade. He grew up under the influence of the CBOT and he remembers going down to the floor when they put prices on the wall with chalk. He worked as a runner on the floor after high school, spent 4 years in the U.S. Air Force, and became a broker/analyst after graduating from Purdue University with an Ag Economics degree in 1991. He has been a licensed commodity broker since 1991 and he is a founding partner in Risk Management Commodities. Futures and options technicals are his strong suit. Sherm Newlin graduated in 1983 from Wabash Valley College with a degree in Management of Agriculture Production. He has been involved with the commodity markets since 1988 when he was a runner at the Chicago Board of Trade. He joined Risk Management Commodities in 2003 as a broker and shareholder. He has farmed his entire life in Hutsonville, IL on his family farm that dates back 170 years. He and his wife are currently raising two kids and his farm operation includes production of corn, seed corn, soybeans and wheat. He enjoys helping his clients implement marketing plans that are realistic and flexible with today’s volatile market environment, using cash sales and option strategies. Jason is a 2006 graduate of Purdue University with a degree in Agriculture Sales & Marketing. He has spent the past six years working at river export terminals and an ethanol plant in northern Illinois as a grain merchandiser. He also operates a 2,500 acre grain and livestock farm with his father in Montezuma, IN. Charlie graduated from Beckman Catholic High School in 1989 and Hawkeye Community Collage in 1991. He then returned Earlville to become the 4th generation to operate the family farm. In 2009 he became a commodity broker and enjoys working with grain and livestock farmers to develop strategies that help manage risk. Bryan graduated from Purdue University in 2006 with a degree in Ag Economics. After graduating he returned to his family farm where he farms with his dad, Chuck. He currently helps manage their 9,000 acre farm and is also a broker for Risk Management Commodities. He and his wife got married in 2010 and had their first child in March 2013. Kelly graduated from Purdue University with a degree in Retail Management and worked in retail for 17 years. She changed careers in order to have more family time. Her family works with the county 4-H swine program and raises show pigs with their daughter.